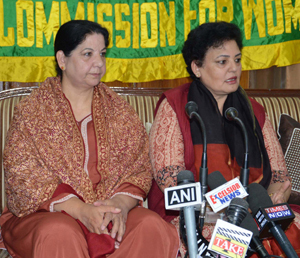 Chairperson, National Women Commission Rekha Sharma addressing press conference on Friday. She was speaking at a press conference held here today Chairperson, J&K State Commission for Women, Nayeema Ahmad Mehjoor was also present on the occasion..
Rekha Sharma said that the programme will start from Budgam tomorrow and will be organized in all other districts also. She said that NWC will provide the requisite assistance to State Women Commission to reach out to the women more effectively and to organise gender sensitization programme for police. Speaking on the occasion, Mehjoor informed that the Commission is also working on gender sensitization programme for police so that police public interaction specially with women folk improves and the issues related to women are handled more effectively by police. She said that the State Women Commission has been working towards making the women aware about their rights and keeping them abreast about the institutions which work for safeguarding their rights and interests. Meanwhile, Chairperson, National Commission for Women, Rekha Sharma called on the Chief Minister, Mehbooba Mufti here today. During the meeting, the Chief Minister enquired about the working of the Commission and sought suggestions for making the State Women’s Commission much more vibrant.